One of the biggest challenges facing people who have limited or no mobility is bathing. Getting in and out of the bath can become a difficult process when your ability to move has been impaired. It can even be dangerous. People who have limited mobility will risk falling or tripping over in getting in and out of their bath - especially if the water from the tub makes the ground slippery. 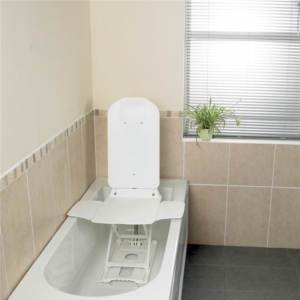 The safest and easiest way to continue using the bath if you have mobility trouble is a bathlift. 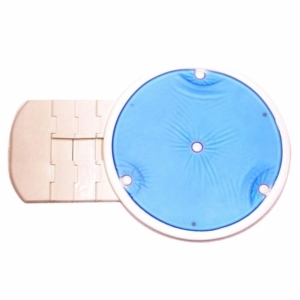 These make getting in and out of the tub safe, secure and comfortable for people with limited mobility. Our range of bathlifts endeavour to reduce the risk of accidents. Most of our bathlifts function in the same way, albeit with a few different features on each model. They are chairs which allow you to easily descend into and ascend from the bath tub taking away the need to climb over the side, settle yourself down or pull yourself up - all of which are the most common times that people have been known to slip or fall. The sides of the bathlifts are fixed on the outer-rims of a bathtub. When you wish to use the bath, you simply sit on the chair and swing your legs into the bath. Your feet will be in the water while the rest of your body sits on the chair slightly above. By pressing a button - which is usually done with a remote control you will receive with the bathlift - you will allow the chair to descend into the water. You should then be able to recline the chair at whatever angle you desire so you are immersed in the water. A similar process is used when you are ready to exit the bath. You should be able to recline the chair back to its original upright position and press a button to ascend from the water. Once it has reached an ample height, you need only move your legs to the side and step off the chair. This process is designed to assist anyone who may lack the upper or lower body strength to climb in or out of a bath. 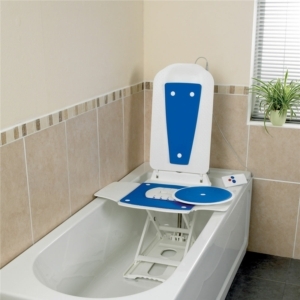 They fit most sizes of baths, they are comfortable to use and they are quite simply the perfect solution for anyone who may be concerned for their safety, or the safety of someone they love, whose mobility could cause problems when using the bath. 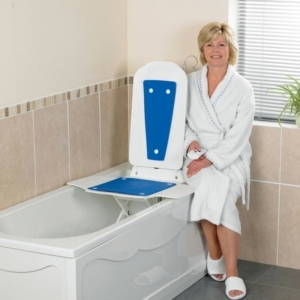 Why purchase your bathlift from Millercare? At Millercare, we have been providing healthcare and mobility products to customers around the United Kingdom for over half a decade. This has allowed Millercare to become one of the most experienced and knowledge names in the industry. We understand the needs of our customers and endeavour to stock only the best products to suit their specific needs. Millercare has showrooms based around the North of England including ones in cities such as Wigan, Manchester, Blackpool, Preston, Warrington and many more. However, all of our products are also available online where we provide free delivery on any orders exceeding £30.